Ten Atlantic right whales were found dead in Canadian waters this summer, many of them washed up on the shores of the Gulf of St. Lawrence. The die-off of the endangered species was unprecedented, especially since there are only about 500 of the whales left on Earth. The last time this many right whales perished in such rapid succession was in the 1930s, during the waning days of commercial slaughter. The whales—giants that grow up to fifteen metres in length and can weigh more than ten school busses—were nearly wiped out early in the twentieth century (their numbers dropped from 21,000 to fewer than 100) for the value of their blubber and baleen. In fact, they received their name because whalers considered them the “right whale” to hunt. While the whaling days may be over, the few hundred Atlantic right whales that remain are once again at risk of extinction—only now, many scientists believe the deaths are not caused by harpoons. Instead, right whales have become collateral damage from the growing shipping and fishing industries. As the latest mortalities make clear, preventing the extinction of the Atlantic right whale will necessitate not only a better understanding of the threats they currently face, but also a willingness to act swiftly to protect them. On August 25, the Fisheries branch of the United States’ National Oceanic and Atmospheric Administration (NOAA) declared the right-whale deaths this summer (including three additional deaths in US waters) an “unusual mortality event,” triggering a deep investigation that will be carried out with help from Fisheries and Oceans Canada. The investigation hinges on one question: Why did so many whales die in such quick succession? As part of its own research, ongoing since June, Canada’s federal government has overseen six right-whales necropsies to try and isolate a cause of death and probe for disease, contaminants, and other factors contributing to fatality. (The other four whale bodies were either too decomposed for a formal investigation or not towed to dry land). In three whales, the preliminary results found blunt force trauma consistent with ship strikes. Meanwhile, signs of entanglement were present in at least one of the dead whales. Ship strikes and fishing gear entanglements by far constitute the greatest threat to survival for North Atlantic right whales. Their migration route spans from Florida to Newfoundland, crossing some of the busiest shipping lanes on the continent. Then there are the many fixed fishing nets, traps, and lines that litter the ocean to harvest high-value seafood. Vertical ropes connecting bottom traps to the surface regularly entangle the whales. They drag the gear, which hampers their ability to feed, increases their stress, and causes difficulty swimming. Entanglement is also a likely contributing factor to declining calving rates, which have decreased by 42 percent over the past five years. 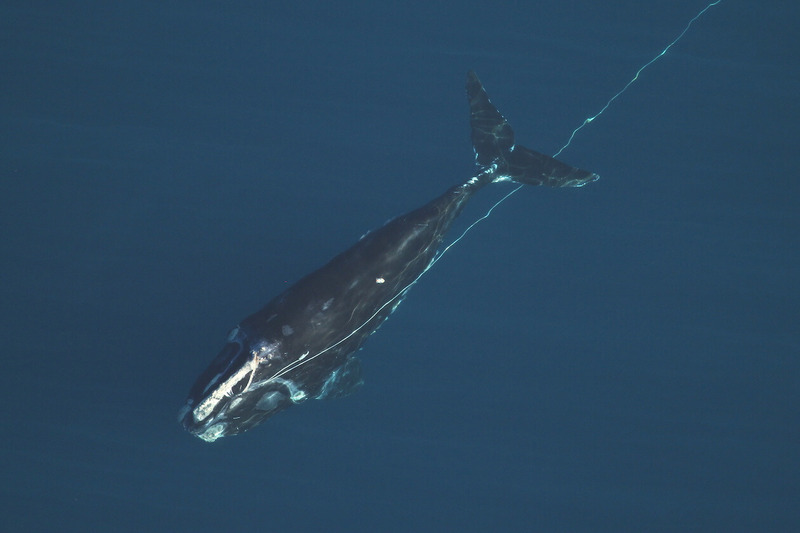 An amazing 80 percent of living right whales have battled entanglement at some point in their lives, often carrying the scars from ropes that can result from dragging fishing gear over great distances. Davies suspects that the whales’ efforts to find food are also playing an underlying role in recent deaths. Atlantic right whales winter and birth their young off the coasts of Florida and Georgia, and spend the rest of the year chasing tiny crustaceans called copepods from hotspots off the coast of New England and into Canada’s Atlantic waters. The whales usually feed from June to November in Canadian waters, historically massing in places like the Bay of Fundy. But this now appears to be changing, putting the whales in closer contact with humans. The declining health of the surviving right whales is evident in a study published last year. Rolland and a team of researchers evaluated over 700,000 right-whale photographs that were taken from the 1980s to the early 2000s, looking closely at the whales’ appearances—specifically, the changes in body shape that can denote malnourishment. The researchers concluded that the general health of right whales gradually deteriorated over those three decades. Barbara Cartwright, CEO of the Canadian Federation of Humane Societies, is a past member of the government’s Right Whale Recovery Plan team created under Canada’s federal Species At Risk Act. She says unless aggressive efforts are made immediately, North Atlantic right whales could go extinct under this generation’s watch. “We’re seeing a population really teetering on the borderline,” she says. And right whales aren’t the only species mysteriously dying. In 2016 and 2017, forty-one humpback whales were found dead along the east coast of the United States, in areas that overlap with right-whale migration routes. The humpback deaths were officially declared an “unusual mortality event” by the US NOAA in April 2017, and an investigation is ongoing. While it is currently illegal to harm, harass, and kill Atlantic right whales under Canadian federal law, the government is in a tough spot: not only are they obligated to enforce species at risk legislation, but they also simultaneously regulate (and, in cases, promote) Canadian marine trade and ocean fishing. The second broad front, Rolland says, is to minimize the impact of the many non-lethal human-caused stressors, including underwater noise levels. “These actions need to be taken immediately to give this population a chance at survival in the long term,” she says. Cartwright lauds the government’s response this summer but says much more needs to be done in preparation for the whales’ return in 2018. Assumptions will have to be made about where the whales will congregate next year, she says, and how to best protect them from human activity—meaning more speed restrictions for boats, fishing restrictions, and potentially moving shipping lanes altogether to reduce ship collisions. Cartwright says authorities can lower the maximum ship speed in areas where whales are known to feed and congregate, and even move shipping lanes away from certain areas. The latter has precedent: in 2003, Bay of Fundy shipping lanes were moved four nautical miles to avoid right-whales feeding habitat, which reduced collisions. “It’s a delicate issue and they have to figure it out,” she says. One bright spot for next year is the development of a new tool that promises to prevent ship strikes. Davies and a large team of researchers and partners, with a funding contribution from the federal government, are working to employ underwater drones that can be programmed to patrol the Gulf of St. Lawrence. Armed with listening devices, the robotic “gliders” can hear right whale calls, making it possible to alert any ships in the area. (A similar early warning system has already been used off the US coast.) The robots will also provide critical new information about whale movements as they chase zooplankton around the busy Gulf of St. Lawrence. Such novel technologies will help. But urgent action is still needed from industry, government, and Canadians themselves. The clock is ticking.